Thu., July 5, 2018, 3:44 p.m.
MEXICO CITY – President-elect Andres Manuel Lopez Obrador promised $7.5 billion for youth job training and aid to the elderly Wednesday, keystone programs that could make Mexico’s business sector one of the biggest beneficiaries of his first year in office. Lopez Obrador pledged the government would pay the salaries of apprentices employed by Mexican companies as part of a $5 billion package of scholarships and job training. The once-fiery leftist met with Mexican businessmen on Wednesday in a surprisingly chummy encounter where he sealed the job-training deal in a handshake with business chamber leader Juan Pablo Castanon. The programs for the elderly and youths will be the cornerstones of Lopez Obrador’s first year in office, which starts when he takes office Dec. 1. “We will have to come up with this funding … even if we are left without a shirt on our backs,” Lopez Obrador vowed. The president-elect – whose victory must still be certified by electoral authorities and the courts – implied that most of his other campaign promises will be left to later years in office. Lopez Obrador was elected in a landslide Sunday. Lopez Obrador pledged $2 billion to extend and increase old-age supplementary payments to the elderly so that every Mexican over 68 will receive at least the equivalent of $2.25 per day. The elderly payments initially started in Mexico City when Lopez Obrador was mayor in the early 2000s, but he has now pledged to fund them at the same level as in the capital – currently about $60 per month – nationwide. But the youth program appeared to be a big gift to the business sector: Companies will get much of the $5 billion to pay salaries to youths; the remainder will apparently go to technical colleges and universities or to scholarships. The firms will give their apprentices certificates of competence, but apparently won’t be required to hire them after their apprenticeships. Juan Pardinas, director of the Mexican Institute for Competitiveness, said plans for apprenticeship programs already exist in the private sector, but it is important that the government is getting on board. The opportunity of a paid apprenticeship could keep many young people from beginning to work in the informal economy as they do now and hopefully set them on a path for better earnings. Lopez Obrador’s third day as president-elect was marked by healing wounds left with business and other groups that emerged during the bruising presidential campaign, in which some businessmen wrote letters to their employees urging them in veiled terms not to vote for Lopez Obrador. On Wednesday, one of the businessmen who wrote such a letter – German Larrea of the mining and rail conglomerate Grupo Mexico – sought to make up with Lopez Obrador. Banco Base analysts noted Wednesday that the peso hit its strongest value of the day after Lopez Obrador’s meeting with the business group. “The communication efforts of Andres Manuel Lopez Obrador and his team in the days since July 1 illustrate their objective of generating confidence in financial markets and the business sector by being emphatic about the importance of maintaining an orthodox fiscal policy and functional monetary policy,” the bank said. Given the venom with which they had attacked Lopez Obrador over the years – Fox, for example, promoted a court case seeking to prevent the leftist from running in 2006 – Lopez Obrador was conciliatory, but not cutting his long-time opponents any slack. 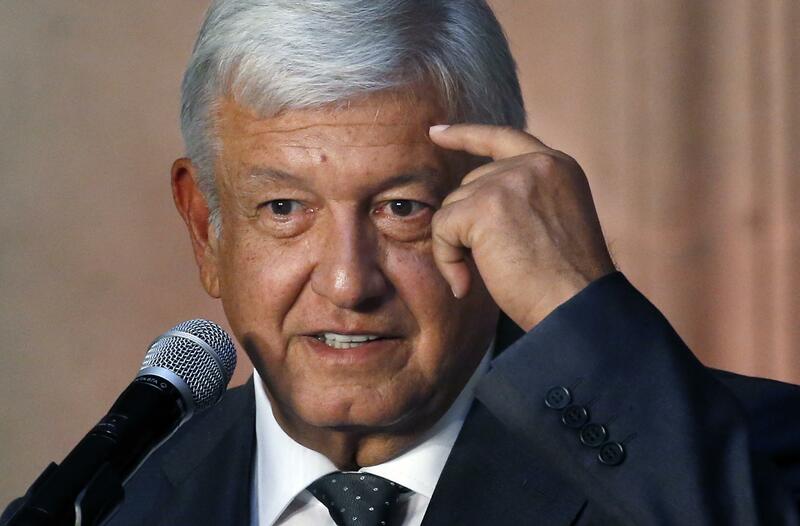 Lopez Obrador thanked Mexico’s former presidents for their congratulatory messages, but said he was still determined to eliminate the luxurious pensions that ex-presidents enjoy in Mexico. The autocratic oil union – run by the same leader since the mid-1990s – had been caught in the past passing millions in government money to the ruling party. Published: July 5, 2018, 3:44 p.m.